I asked for some book recommendations on facebook recently and ‘These is my Words’ came with rave reviews. I devoured it after it came in at the library. The book had action, adventure, romance, and realness. There is something for everyone, so I am guessing you would like it, too. As was the case in ‘The Help’, I had to get past the incorrect grammar, but it was well worth it. Besides you read this blog, so you probably have already adjusted to poor grammar. I loved the heroine! She was brave, independent, spunky, opinionated and yet tender-hearted. (You can see how I would relate to such a character.) I didn’t want the book to end and I’m secretly hoping maybe they’ll make it into a tv series or movie (in my mind this would be a better idea than in reality, as such things tend to kill a good story). Oh are my children a wonderful burden. A burden I thank God for every day. In fact, I pray that he would increase that burden, if you know what I mean. I think I read less this year than last, but here are my top five picks. I dare you to read them. 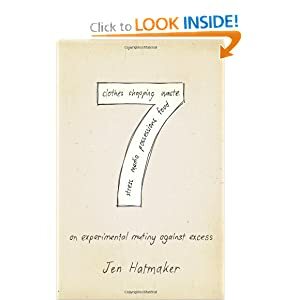 7 by Jen Hatmaker - about shedding excess. What American doesn’t need to read this? 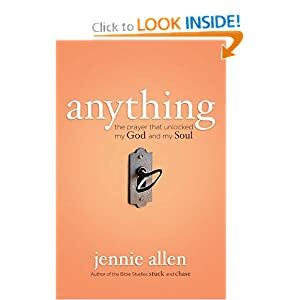 Anything by Jennie Allen – about surrendering to God anything and embracing the beauty that comes with it. 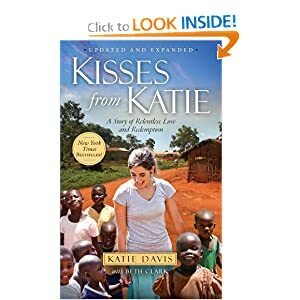 Kisses from Katie by Katie Davis- About the courage to go, alone, to a foreign country and be the hands and feet of Jesus. Just try reading those top three without having your heart challenged. Seriously. Try it. 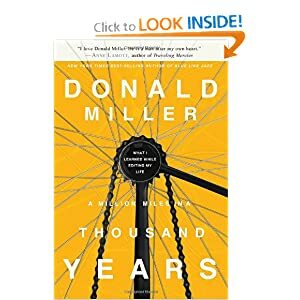 A Millions miles in a Thousand Years by Donal Miller – About taking risk in order to live a great story. 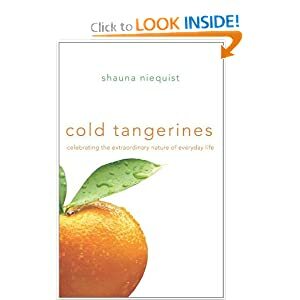 Cold Tangerines by Shauna Niequest about celebrating everyday life. These are all non-fiction picks. I did read some fiction including John Grisham and an occasional Nicholas Sparks. With those two you always know exactly what kind of story you are getting. 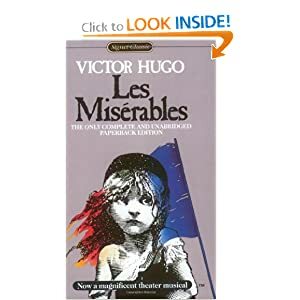 I do have to add that if you are going to see the movie Les Mis, I highly, highly recommend reading the book first. I had to read it somewhere back in my education experience and it is still one of my all time favorite books. Les Miserable by Victor Hugo = Amazing. I can also tell you that I did NOT read the top 3 sellers for 2012. Just an FYI. What should be on my list for 2013? No review needed. I loved this book. It was funny. It was challenging. It was timely. Now is the time, too, because you can be part of Bloom (an online book club) and watch videos of the author, Jen, chatting up each chapter. I am in official countdown mode until Jen’s 7 bible study come out (January 2013). I can’t wait! I’m late to the party, but I finally read Cold Tangerines by Shauna Niequist. Her writing is really more of a series of short stories/excerpts. It took me awhile to get over the fact that the chapters may or may not happen in chronological order or follow a specific pattern. 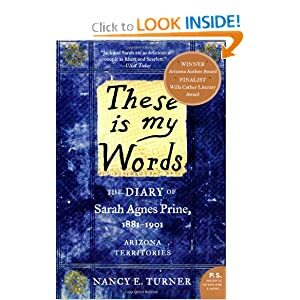 The result is that some chapters I loved and others I skimmed, but as a whole the book was sweet and uplifting. I specifically loved the chapter titled ‘puppies’ in which she describes her leading a small group of teenagers at her church’s youth group. It could have been me writing! I have loved, loved, loved serving with our church’s youth ministry and I have learned and laughed so much with the girls there. They mean more to me then they will ever know. Shauna ended the book talking about wanting to live a life full of joy. I want a life that sizzles and pops and makes me laugh out loud. And I don’t want to get to the end, or tomorrow, even, and realize that my life is a collection of meetings and pop cans and errands and receipts and dirty dishes. I want to eat cold tangerines and sing loud in the car with the windows open and wear pink shoes and stay up all night laughing… and I want my everyday to make God belly laugh, glad that he gave life to someone who loves the gift, who will use it up and wring it out and drag it around like a favorite sweater. I, too, want a life that sizzles and pops and most days I feel like that is just the life I have. PS and if you need a break from all my adoption talk this book is completely void of that. How do we know God or grow in him? Prayer, reading the bible, church, worship, experiences, suffering, confession, community, etc. But, a lot of people do those things and may never really know God. Jennie Allen and her husband decided to risk it all and pray to God that he could have Anything and do Anything with their lives. This is a dangerous prayer to pray because the follow up to it is obedience. Jennie takes us through her journey of searching for God, finding her ‘need’ for God, and then allowing God to have and do anything with her life. In giving God everything, Jennie and her husband were led to pursue adoption. Even though they felt this call, they still doubted (just as we still fight off doubts and mainly, worries). She asked a friend if they were 100 percent positive when they adopted. Friends and family tried to discourage them from becoming too extreme, too radical. But, in the end, they chose to obey God. “It had only been 24 hours since he had become ours, and yet I knew that no matter what challenges lay ahead, this could be the most beautiful story of my life. This book was beautifully written and this review doesn’t do it justice. I resonated with Jennie’s doubts, insecurities, and her willingness to risk it all. I acknowledge that more often than not I am afraid to obey God. But, I know and believe that a life lived for him is better than anything I could accomplish living for myself. I take that risk. A few weeks ago we watched the movie, The Vow. I was all ready to love it because I knew it was based on a true story. But, instead I felt confused and disappointed. *Spoiler Alert * I couldn’t believe he divorced her and how the story ended with them just sorta kinda dating again. It all left me wanting something more. A story with more depth. Some of you know I really don’t like to buy books, but I just had to know how the real life version was different from this less than satisfying movie version. So, I plunked down the change with an audible gasp and came home with The Vow tucked in my purse. I am happy to report that the book is way better. It makes significantly more sense and *spoiler alert* of course he doesn’t divorce her! Faith in God was a vital part of their dating, short marriage, accident, recovery, and re-newed marriage. Barefoot Church by Brandon Hatmaker (husband to one of my favorite bloggers, Jen Hatmaker) is a book about engaging the church in social renewal and serving the least. I am all on board with this topic but often struggle with what to do with my knowledge, passion, and burden. It has resulted in a lot of tension in my life. I was so relieved to read these words. I think it is fair to say that I am NOT a complacent person. I am always searching, seeking, and striving. I have been told, and rightly so, that I live with a lot more tension than the average person. I would be tempted to take that as an insult, but I see how tension has produced change in my life; making me a better wife, mom, friend, and follower of Christ. So, I embrace the path of tension that is indeed scary and dangerous, but full of wonderful adventures! Do you live with tension in regards to faith and action? What do you do about it? Here is Brandon’s advice for moving forward. I just finished reading ‘20 Things Adoptive Parents Need to Succeed‘ by Sherrie Eldridge, an adoptee. I loved this book! It included a lot of research, resources, and activities to help families. It is highly reviewed on Amazon and I would encourage adoptive parents to read it. Considering I have a counseling degree and teach child development courses non-stop, I have had a false sense of confidence in approaching adoption/attachment issues. This brings me to my knees. I was encouraged by this quote from the book. I think these words are good advice for many relationships. We all have the desire to be heard, understood, and accepted. Parenting is messy business. Children do not arrive with instruction manuals. I am not going to have all the answers, but I can do my best to be present and available. I am also reminded that I do not parent alone. My heavenly father has already applied these healing words of comfort. What movie will you be watching this weekend? So, everyone (myself included) is excited about a certain move that opens this weekend. I read and loved The Hunger Games, but I’ll be watching a different movie that also premiers this weekend. October Baby is a movie with a message about the sanctity of life. Plus 10% of the movie profits will benefit Every Life is Beautiful. They will distribute funds to frontline organizations helping women facing crisis pregnancies, life-affirming adoption agencies, and those caring for orphans. Several blogs I read kept posting about Kisses from Katie. I finally took the time to reserve it from the library and am so glad I did. Watch the video to hear from Katie herself! Katie decided to take a year off between high school and college to volunteer at an orphanage. What she didn’t know was that God planned to turn that year into a lifetime. She opened up her heart to the sick and hurting and started a non-profit to help meet the basic needs of children. “There are 143 million orphaned children (throughout the world), 11 million children who starve or die from preventable diseases, 8.5 million that work as child slaves or prostitutes, and 2.3 million that live with HIV. This all adds up to 164.8 million needy children. At first glance that looks like a big number, but 2.1 BILLION people on this earth proclaim to be Christians. The really exciting thing is that just as I was finishing this book our youth pastor asked if we would share our adoption journey at church. What great timing! I am reminded how no matter our age, we all have the opportunity to impact and make a difference. I see, especially, how teenagers are eager to be part of that 8% and use their voice for the less fortunate.